I love beer. After now having visited over 425 different breweries, it’s fair to say I have sampled a lot of beer (follow me on Untappd). From post-race pints and run club meeting locations, to beer miles and relays, running and the kegged nectar seem to go hand-in-hand in Oregon. Our Kegs and Legs feature is where beer & cider drinking runners like me can go to find some new favorite beverages. Check out previous posts here! Costumes are highly encouraged, there will be candy aid stations, and activities for kids (and adults) at the Kennedy School after the race. I don’t know about you, but I am on the quest to become a Cosmic Tripster with the McMenamins Passport. I have been to many of the outlying, and generally more challenging, locations – Gearhart, Roseburg, Bend – but one that I hadn’t been to until just recently is the McMenamins Kennedy School. They are one of the McMenamins locations that has lodging on-site, as well as multiple bar areas with later hours of operation. I was able to cross a few off of my list when sampling some beer recently, but will definitely have to return for the rest (maybe after a 5k…). The grounds of the Kennedy School are amazing. It’s pretty unassuming and smack down in the middle of a neighborhood (it was a school after all), but like always, McMenamins has done a fantastic job of giving it its own style and flair. In addition the bars, and a restaurant with a beautiful outdoor space, there is also a movie theater, soaking pool, and their actually brew their own beer in what used to be a bathroom! Definitely check out the recent OBS podcast featuring the son of the “original” McMenamins. 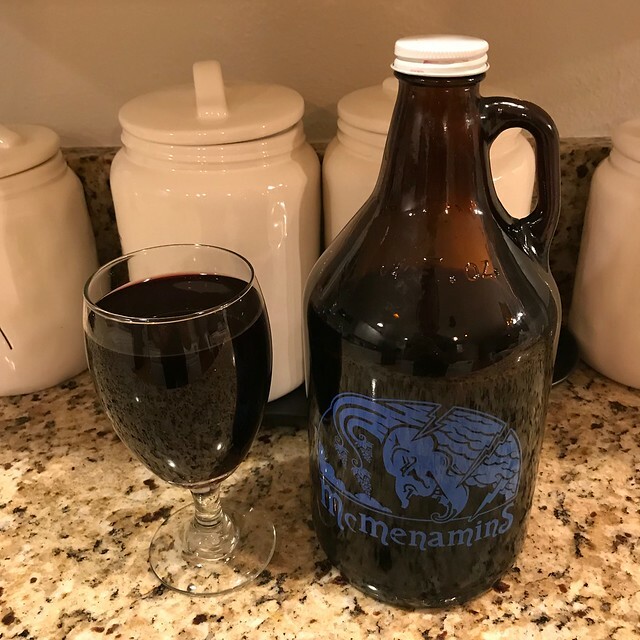 We recently checked out took home a growler of their late summer seasonal offering from McMenamins – their Blackberry Cider. This comes in at just under 7% ABV and is a super refreshing option anytime – but especially after a 5k. It pours a beautiful purple/red color and the aroma is delicious from the glass. It’s definitely on the sweeter side of ciders, but the tartness from the blackberries balances it out quite well. Beginning October, their seasonal cider will be the delicious sounding Crangerine Dream, so check that one out if they have it on tap at Kennedy School following the event on October 27th! Remember that they have 4 racks marked for free Biketown, so you can pick up any orange rental bike and park it for free here (you don’t have to find a hub dropoff)! Consider this when coming out to the race, or even on your next trip to the area.